Setting aside environmental concerns and ignoring the threat to one of the most fertile belts in India, Uttar Pradesh government is set to start work on the eight-lane expressway along the Upper Ganga Canal. The 147.8 km expressway will connect Greater Noida in Gautam Budh Nagar district and the Uttar Pradesh- Uttarakhand border. The state government will receive tenders for its ambitious project till September 20. Sources in the government said earmarking the land for expressway is already on, while acquisition of land is being studied. The Rs 8,200-crore project, being developed by Uttar Pradesh Expressways Industrial Development Authority (UPEIDA), will be executed on design-build-financeoperate- and-transfer pattern in public private partnership. The expressway would run from Sanauta Bridge in Greater Noida to Purkazi in Muzaffarnagar district. Although the government says the expressway is necessary because of increased traffic on National Highway-58, which connects Ghaziabad to Badrinath in Uttarakhand, it has failed to study the vehicular traffic pattern in the area. 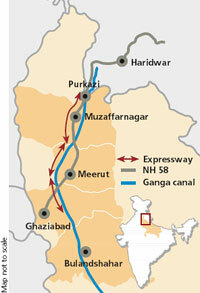 The proposed eight-lane expressway will pass through the agricultural tract of Ganga-Yamuna Doab. I B Singh, senior geologist at the Indian National Science Academy in Delhi said a big chunk of A-grade agricultural land would be put at stake. "Muzaffarnagar has the highest rural per capita income in India and is known as the sugar belt of India. I have worked extensively on the Ganga plain for years and the fertility of this land is still a classic example," said Singh. He said the Ministry of Agriculture should issue directives that rich fertile land should not be diverted for infrastructure, real-estate development or educational institutions. The project proponent has also not carried out environmental impact assessment. Deputy Conservator of Forests with the Ministry of Environment and Forests, Ritu Raj Singh, in his survey report noted that due to good natural vegetation, animals like nilgais, monitor lizards, foxes, jackal, porcupines, rabbits and snakes are abundant in these forests and they would be affected if environmental clearance is given to cut these forests. Singh also contradicted the claim by the Uttar Pradesh government that 34,477 trees would have to be felled for the project. In his report he has stated that 90,000 to 100,000 trees would have to be chopped for the expressway. Officials in the state government also fear the expressway could give rise to man-wildlife conflicts in the area. The authorities are concerned that construction activities may pollute the water body. The selected bidder will have water sports rights in the canal. The 155-year-old canal constructed between the Ganga and Yamuna rivers, is primarily an irrigation canal which irrigates around 9,000 square kilometres of fertile agricultural land in 10 districts of Uttar Pradesh and Uttarakhand. Officials in the irrigation department think that renovation of the canal is a must before the work on the expressway begins. But seeing the high cost involved in building the expressway, builders are reluctant to carry out the renovation work and the Uttar Pradesh government has given in to their demands. The project originally comprised construction of the canal expressway, link expressways, hydroelectric power stations, development of land parcels and navigational facilities. Since the bidders for the expressway did not show interest in navigational facilities, such facilities have been made optional. The cost of the project with navigational facilities is around Rs 8,200 crore of which Rs 7,000 crore is for canal expressway, link expressways, hydroelectric power stations and Rs 1,200 crore is for renovation and other works to be taken in the canal to make it fit for navigation. A team of experts, comprising Indian Institute of Technology professors and the irrigation department officials, has prepared a feasibility report for navigation in the canal. According to it, renovation and strengthening of canal walls is necessary to make it usable for the expressway as high-load vehicular traffic would pass through it at high speed. "The highway shall be used for highfrequency traffic and heavy-load vehicles. This would certainly cause varying stresses and strains on the canal banks and the ongoing masonry works, thus needing proper and sound renovation works on canal banks before the work on expressway begins," the report said. The Mayawati government has even offered sops worth several thousand crore rupees to encourage investments as it has no funds to commission the project. These include toll tax, land parcels, hydropower, navigation and water sports rights. The construction company would get an assured land parcel of 92.50 hectares (ha) spread over six locations on the banks of Upper Ganga Canal. The builders can also opt for 1,890 ha of land parcel spread over 19 villages in three districts. 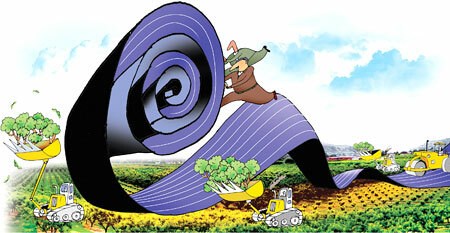 The land parcels would be given on lease for 90 years at a cost of Rs 100 per hectare annually. The company can also construct hydroelectric power stations at seven locations under the project. Six ha of land will be given for free to the selected company at Dasna in Ghaziabad and Jauli in Muzaffarnagar for the construction of the power stations. Rajendra Tyagi, Municipal Councillor of Ghaziabad who has filed an Right To Information application seeking project details, said, "From the terms and conditions, it seems the project has been proposed at the behest of a company and not the government." He said the project was most likely to be awarded to Jaypee group. "The project is just going to be a means to pocket money for the government and officials," he added. The authorities at the Centre questioned the need for the expressway. Azam Zaidi, Chief Conservator Forests with the Union Ministry of Envi ronment and Forests, in the report has questioned the purpose of building the expressway, which would pass through Bulandshahar, Gautam Budh Nagar, Ghaziabad, Meerut, Muzaffarnagar and Saharanpur districts of Uttar Pradesh. He noted there are already two roads— NH-58 and Kawar Road on the left bank of the canal—which connect Ghaziabad, Meerut, Muzaffarnagar with Uttarakhand. "Widening of these two roads is being undertaken. Once the widening is completed the traffic would be regulated and another road or expressway may not be required," he noted in his report submitted to Environment Ministry in July. Senior UPEIDA officials in Lucknow who did not want to be named said it would work as an alternate road route to NH-58 in Uttar Pradesh. They said the NH 58 is very narrow and passengers are often stranded in traffic jams. The expressway would give a fast and hasslefree drive without any signals. Rajendra Tyagi alleged that no survey of the vehicular traffic on the national highway has been undertaken by the state government. He said he would soon file a public-interest petition against the construction of the expressway. "The documents I have collected through the RTI application filed with the Union Ministry of Environment and Forests, UPEIDA and the Uttar Pradesh Forest Department are spilling the beans. The Uttar Pradesh government does not have any blueprint, nor has it prepared the agreement to be signed between the government and the company," Tyagi alleged. Keeping in purview the problems and difficulties faced by the daily commuters form Meerut and adjoining area to Noida and Grater Noida and to Delhi and for the connectivity to Uttranchal all the comments given is not convincing.Moreover the state is planing to compensate for the vegetation and wild life conservation alternatively.